A trifle is a very traditional English dessert that's usually made from a mixture of sponge cake, fruit, jelly, custard and cream. Although we tend to think of trifle as an old-fashioned dessert laced with sherry, there are many modern twists on the classic — so read on for some tasty trifle recipes, including Italian tiramisu and banana and rum trifle. There are also some recipes for sponge fingers, custard, and Swiss roll, so you can make your trifle from scratch if you want to. Carrot Cake Recipe - A lovely, sweet cake that is perfect with tea or as an afternoon snack. Fondue Recipe - Traditional Alpine dish of melted cheese that is served in a communal pot in the middle of the dining table for everyone to dip into. Rice Pudding Recipes - An incredibly comforting dessert made from rice and milk, water or cream. Toffee Recipe - Chocolate, vanilla, and many more flavours of this hard sweet. The very earliest recipe for 'trifle' was published in 1576 — it was a thick cream that was flavoured with rosewater, sugar and ginger, and it wasn't until 1747 that jelly was added to the dessert. There are many, many trifle variants — one such variant is the use of soft drinks, such as ginger ale, to moisten the cake. Another variant that we're all probably more familiar with is when liquid jelly is poured over the cake. It then sets and binds with the sponge, which gives a pleasing texture. 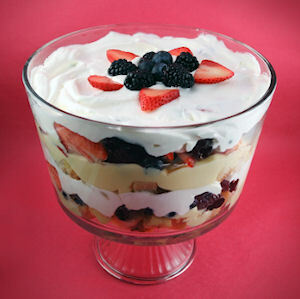 Trifles are more often than not served in large, glass serving dishes, so that all of the layers of trifle can be seen through the glass.